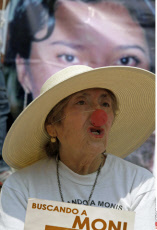 MEXICO CITY, May 14 2013 (IPS) – When people are forcibly disappeared in Mexico, it does not necessarily mean that the victims are immediately killed. In this country of entrenched violence, forced disappearance is also a method used to feed the markets for sexual exploitation and slave labour. Mexico has regressed “to the barbarism of Roman gladiators,” lawyer Juan López, a legal adviser to Fuerzas Unidas por Nuestros Desparecidos en México (FUNDEM), a support group for families searching for their loved ones, initially in the northern state of Coahuila and now nationwide, told IPS. In today’s Mexico, where organised crime is rampant and public security has been militarised, forced disappearances do not follow the pattern seen in past decades in this country and others in Latin America, marked by dictatorships, “dirty wars” against opponents and armed conflicts. These days “just about anyone” is vulnerable, López said. An unknown proportion of the victims fall prey to “illegal businesses that produce lucrative profits from an unpaid slave labour force,” he said. This includes the forced recruitment of teenagers and young adults as hired killers, workers in the production of drugs or to serve other needs of the cartels, or for organ trafficking. “There have been confirmed reports of buses stopped by armed groups who take away all the young men,” López said. 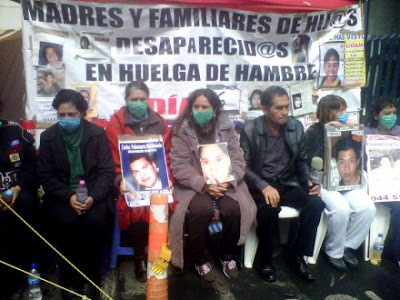 On May 9 a dozen women and a few men decided to begin a hunger strike in front of the modern facilities of the Attorney General’s Office to obtain an interview with President Enrique Peña Nieto and demand that he assign someone to be responsible for investigating the whereabouts of their relatives ‘disappeared’ in recent years. May 10 is Mother’s Day in Mexico, but instead of celebrating, many mothers will be marching to protest their children’s disappearance. Mothers and other family members of the disappeared from around the country gathered in Mexico City for the Second March for National Dignity. More than 5,300 people have disappeared in Mexico since December 2006, according to Mexico’s National Human Rights Commission. Photo: Marco Ugarte/AP/SIPA. 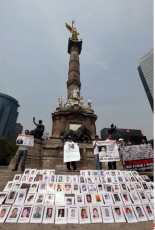 Photo copies of people disappeared line the steps of the Angel of Independence monument where relatives and friends gathered after participating in the National March for Dignity on the day Mexicans celebrate el Dia de La Madre, or Mother’s Day, in Mexico City. Photo: Marco Ugarte/AP/SIPA. The grandmother of Monica Ramirez holds an image of her missing granddaughter at the Angel of Independence monument where relatives and friends gathered after participating in the National March for Dignity on the day Mexicans celebrate el Dia de La Madre, or Mother’s Day, in Mexico City, Friday, May 10, 2013. Mothers and other relatives of persons gone missing in the fight against drug cartels and organized crime are demanding that authorities locate their loved ones. Press here for original link. Nothing to celebrate. Mexicans living abroad. Mexicans living abroad! Do not be indifferent to the pain of these mothers. Thanks to their struggle to find their disappeared, our families in Mexico have not encountered this tragedy. Support these mothers with letters to authorities in Mexico and the country where you live and/or with financial assistance to organizations such as FUNDEM, FUUNDEC, CADHAC, HIJOS Mexico, Human Rights Centre Victoria Diez, etc.